The Centre for Promotion of Social Concerns (CPSC) is a Charitable Trust registered on 17.11.1981 under Indian Trust Act. The said trust presently runs a program unit called “People’s Watch” which in turn undertakes programs on Human Rights Monitoring, Human Rights Education and Rehabilitation Centre. 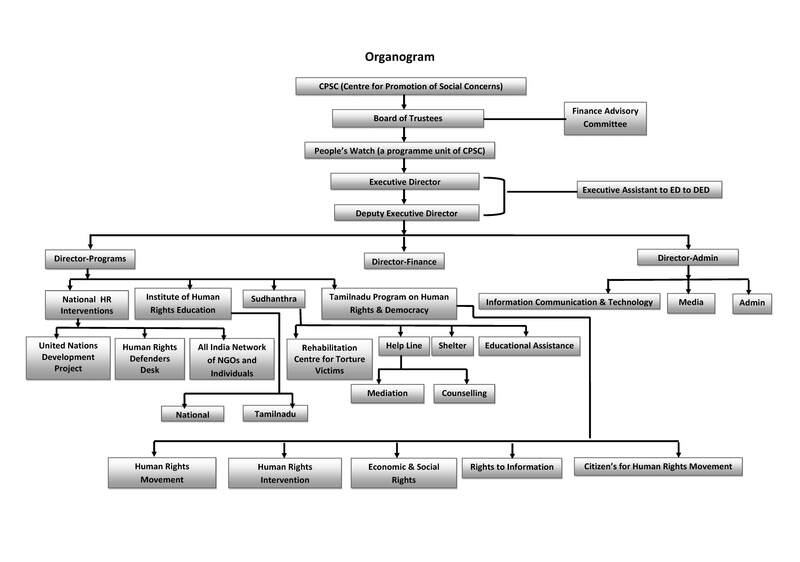 These activities are carried out by the sub units of People’s Watch viz., Tamil Nadu Program on Human Rights & Democracy, Institute of Human Rights Education & Sudhanthra (Rehabilitation Centre for victims of domestic violence and torture) which is headed by an ‘Executive Director’ appointed by the Board of Trustees. The present Executive Director is Mr. Henri Tiphagne who can be contacted at henri@pwtn.org or if its urgent on his mobile +91-9894025859.